Ketoconazole 200mg tablets are an oral medication that can be given to cats and dogs of all weights to treat various internal and external fungal infections. Ketoconazole is also used to treat Cushing's disease. The drug works by blocking the formation of cortisol in the adrenal glands. Ketoconazole is the Generic Alternative to Nizoral. Side effects may include vomiting and diarrhea, loss of appetite, drowsiness, itchiness and rashes. Always give Ketoconazole tablets with food as it may greatly reduce some of the above side effects. This medication may cause liver toxicity or blood disorders. This medication should not be used in animals allergic to it or similar medications. Do not use in animals with liver disease or clotting problems. Do not use in pregnant or nursing animals. Do not give this medicine within 2 hours of an antacid. Do not give Ketoconazole 200mg with cisapride, astemizole or terfenadine. Seek caution when using in conjunction with phenytoin, phenobarbital, theophylline, cyclosporine and anticoagulants such as warfarin. Always tell your veterinarian and pharmacist what other medications your pet is taking. 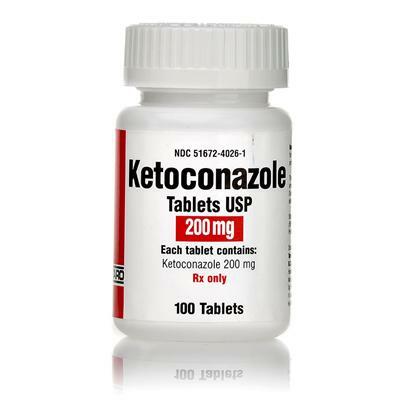 Ketoconazole 200mg is a prescription drug. Always be sure to disclose any other medications that your pet may be taking when speaking with your veterinarian. In order for Ketoconazole 200mg tablets to be most effective do not skip or miss a dosage unless directed otherwise by your veterinarian. Depending on the condition being treated, the typical dosage for Ketoconazole 200mg for both dogs and cats is 2.2-13mg per pound every 12 to 24 hours.